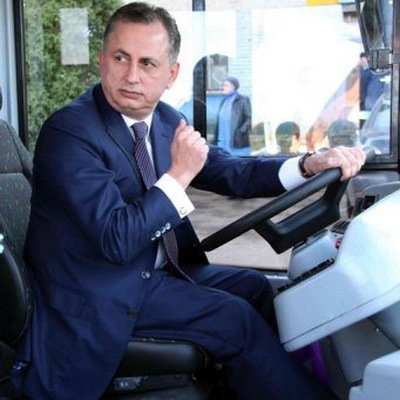 LVIV, Ukraine -- Ukraine's deputy prime minister may have a hard time moonlighting as a chauffeur in another life, after crashing into a police car while driving a bus in the western city of Lviv. Ukraine's Deputy-Prime Minister Boris Kolesnikov. Charged with overseeing the Euro-2012 football championships which Ukraine is organising with Poland, Deputy Prime Minister Boris Kolesnikov arrived in Lviv to examine buses manufactured by a local factory to be used during the matches. Minutes after taking the wheel for a spin around the area, Kolesnikov hit a police car parked nearby, dragging it some 20 metres (65 feet). Although the police car was empty and nobody was hurt, a bumper was mangled and a light smashed in the incident. "What happened?" Kolesnikov asked, in the presence of several reporters. "Nothing serious, drive on," a factory executive replied. The chauffeur of the bus, however, was not amused. "How can anybody drive like that?" he asked. "One must take the size of the bus into account."